So, I’m walking into a store the week after Christmas. I see racks of Christmas clearance items which is to be expected but then what to my wandering eyes should appear…………………..shelves being stocked with Valentine items!!!!! Really?? The stores can’t even let you bask in the Christmas glow another week. It’s all about the profits for them and no longer about the customer. It’s sad actually. Yesterday, I was in Michaels and they had St Patrick’s Day items out. Can we focus on one at a time please? Let’s just work with Valentine’s Day here and now. Now, how many people on New Year’s Eve have the goal of losing weight? Statistics show that it’s the #1 resolution. It’s going good – oops, here’s Valentine’s Day with all the boxes big and small of candy everywhere!!!!! It’s not only chocolate but overpriced just like the roses that will be sold in dozens!!!! 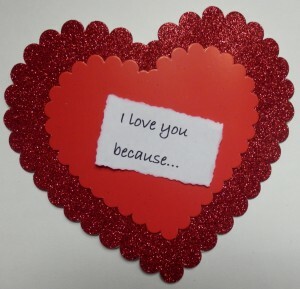 You want to show that special someone(s) that you love them but if they’re doing well in their weight loss, you don’t want to derail them nor do you want to spend a fortune. What are your options? How about a book with or without photos. Michaels has these hologram hearts. There are 5 in a package and really quite pretty (probably about 6” across). They are $3.99 for 5. 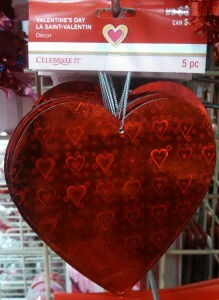 Then in the children’s section, there is this package of 12 hearts in 3 different sizes and 2 different textures for $1.99. Six are smooth and 6 are red glitter. 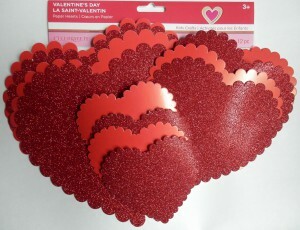 They also have several different red, textured cardstock papers, thin ribbon and wide ribbon. Create a little booklet using any variety of cardstock (and ribbon if desired). Hold it together by making a hole and fasten with either ribbon or a metal ring from either the side or the middle. 3- For children, make it a treat book where each page has treat that can be “cashed” in like a coupon. For example, ice cream, cake, candy, etc. When they have to give up a page/coupon for a treat, it not only makes them aware of a set amount but the anticipation of using another keeps the thrill going. Bonus- Make a mini scrapbook with photos of special moments along with some journaling. Michaels has chipboard with a hole already punched in and fastened with a hook like that above. Just cover with paper, add photos with journaling and voila, a thoughtful gift. Here’s one last thought if you don’t want to buy hearts. I cut this from some recycled cardboard. I rubbed red stamping ink over the top and inked the edges in black. I’m big on inking edges as I think it gives anything a softer look. In keeping with the “rustic” theme, I cut a heart from some red burlap and pinned a message to it to create a cover. 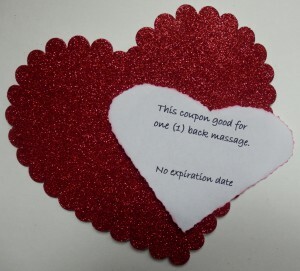 Valentine’s Day doesn’t have to cost a lot. 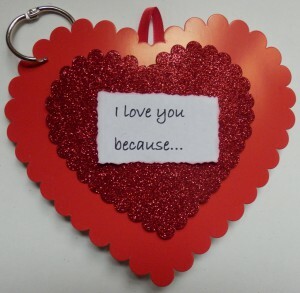 The purpose is an opportunity to remind your loved one(s) how much they mean to you. Be creative. I hope I inspired you with these ideas and I also hope I helped make your day meaningful. 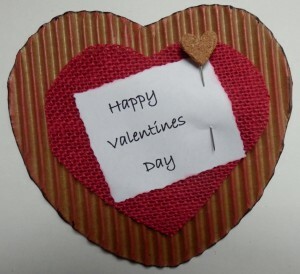 Happy Valentine’s Day to you and yours. I absolutely agree with your thoughts on how disheartening it is to see a holiday replaced almost before it’s officially over! Last winter I was traveling, needed some new winter mittens and discovered that all winter clothing was being replaced with spring merchandise! And there was still snow on the ground! These are such good ideas! I’ll check out your Christmas gift ideas, next! I understand crafters having to get ready for Christmas early. It takes time to make gifts or create items for craft fairs. However, there is no need to rush the seasons! Hopefully you found CHEAP mittens since they were getting ready for Spring. This is a nice post. This is going to be useful for my wife’s birthday!!! Thanks for the post Debbi! Love these ideas Debbi. You are going to cause some happiness in a lot of homes this Valentine’s Day.